To cap off the February Daring Cooks challenge, I made Baklava. I can't think of an easier or more fun way to wow your dinner guests than to make a big batch of this sweet, flaky, nutty Greek dessert. I enjoyed the process of making this so much because I found the layering and brushing and more layering really hypnotic and meditative. But I tend to zone out when I'm in the kitchen anyways. Now that I think about it, for this recipe, it actually helps to pay close attention since you have to keep track of how many layers you've made! The end result of this recipe (from fun new-to-me food blog Elly Says Opa!) was out of this world. The ease of preparation-to-impressiveness ratio of this recipe was especially high. This one has already been added into my regular rotation, and I can't wait to make it again! 1. Toast the walnuts, either in a dry skillet or a 300 degree oven, until fragrant. In a food processor, combine walnuts, cinnamon, and cloves, until walnuts are finely chopped. Preheat oven to 350F. 2. Grease a 9×13 pan. Line the bottom of the pan with one layer of phyllo dough. Using a pastry brush, coat the phyllo with melted butter. Add another layer of phyllo, and brush with more butter. Continue this process until you have layered 7 sheets of phyllo. 3. Spoon 1/4 of the nut mixture evenly over the top. Repeat the process of the phyllo/butter layering again, but this time use 5 sheets of phyllo. Continue the layering of the 5 sheets of phyllo and 1/4 of the mixture of walnuts. Finish off with 7 layers of buttered phyllo, and brush the top with butter. 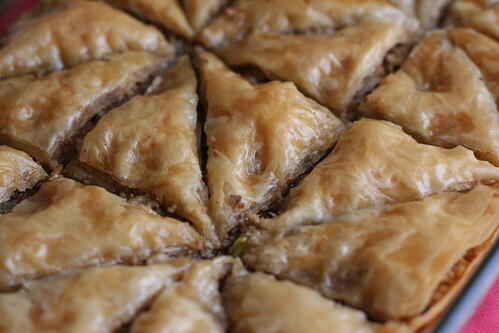 Using a sharp knife, cut your baklava into triangles. 4. Bake for about 50 minutes, until golden brown. Remove from the oven and cool completely. 5. To make your syrup, combine all the ingredients and bring to a low boil. Lower the heat and simmer for 10-15 minutes. Pour the hot syrup over the cooled baklava. Allow to rest for at least 20 minutes before serving. Yum, yours looks delicious! So glad to hear it was a hit! I LOVE baklava. It has been so long since I made it. 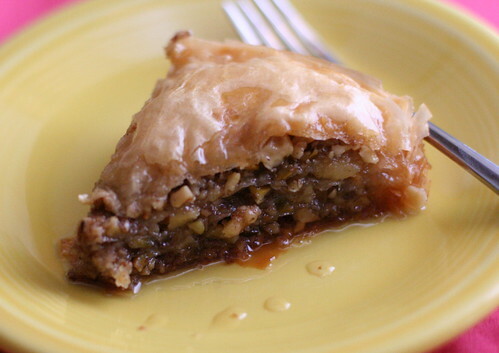 We used to live next to a Greek family and when that lady made baklava, they had to chase me out of the house with a broom - hands sticky with honey and phyllo dough stuck to my face. Delicious! I've made baklava a couple of times. I always find working with filo stressful but I do love the result. You did a beautiful job with this! This is one of my dad's favorite treats. I am starring this post for when he visits! Thanks. Looks amazing! I love baklava, but it has always intimidated me. I'm curious to try it though! Wow - this sounds good too! I've never had baklava, but man do those look good. Now, to find phyllo! This looks incredible! So syrupy and delicious. I really need to try working with phyllo dough. the recipe calls for 1/4 of the nut mixture after the 7 layers, and then another 1/4 of the nut mix after the 5 layers, but what about the other half of the nut mixture? or should it be 1/2 and 1/2 instead? zoe~ Hi, thanks for your comment! The recipe's worded a little funny, but basically you're supposed to continue layering 1/4 of the nut mixture and adding more phyllo until you've used it all up (so, twice more, but with 7 sheets of phyllo on the very top). Hope that makes sense, and hope you enjoy it!! Fantastic recipe! I've made this twice and had amazing results both times. Thanks!